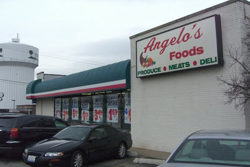 Angelo's Foods in Downers Grove carries a variety of deli products including homemade Italian beef, sausages, pastas, and hot and cold sandwiches. We also have ground chuck, krakus ham, American cheese and turkey breast. Our staff is available for catering, so book us for your next event. Try our delicious fried chicken. We do our best to accommodate last minute requests, including large parties up to 72 hours before an event. We pride ourselves on our varied deli, reasonable prices, clean store, and friendly associates. We also strive to give back to the community by donating to local charities. We do have a $10 minimum on credit card transactions, but will accommodate you as best we can. Listen to upbeat music while you look through our selection of French and Italian breads, marinara sauce, pasta, antipasto, giardiniera, cheese, lasagna, chicken parmesan, and canned goods. We believe in quality over quantity, only stocking what we know we can sell and what our customers like so we don’t waste anything and your products remain top quality. Some items at Angelo's Foods are so popular they will sell out before the end of the day, so get here as soon as you can. We are on the corner of Maple and Belmont. Don’t forget about our beer and wine selection. Our butcher will also answer any questions you have and custom cut meat fresh. Did we mention our tiramisu, butter cookies, and cannoli’s? Find better quality at cheaper prices than chain grocery stores, guaranteed. Find out more about customer experiences on Yelp! Stop in soon… we know you’re getting hungry.